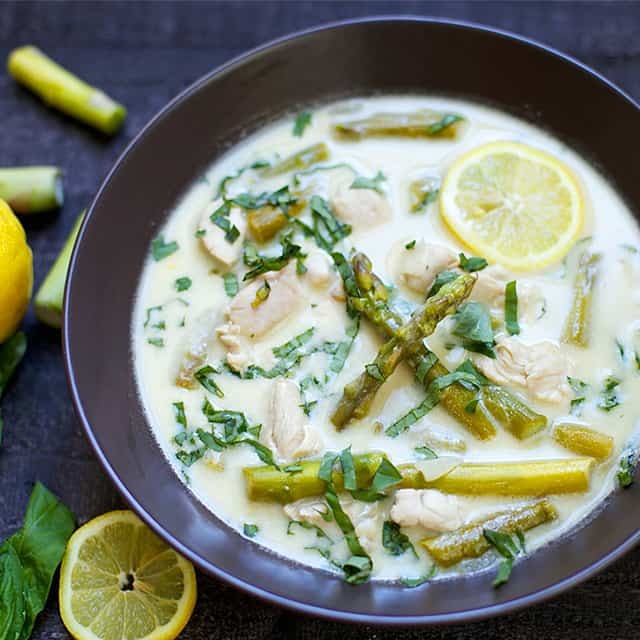 You’ll love the creamy texture and flavor of this delicious lemon chicken and asparagus soup! 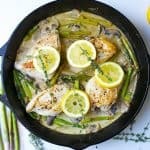 It’s perfect to welcome spring, or anytime you are craving comfort food in a healthier variation! 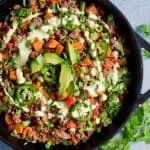 Recipe is also Paleo, Whole30 approved, and dairy-free. Say HELLLLLOOOOOO to spring with this bowl of fresh goodness! 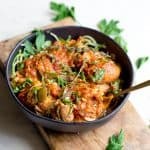 I created this dish in honor of that chilly weather that might still linger during this time of year, and you’re not quite sure what to make for dinner. This soup is IT!!!! It’s kind of perfectly timed as I look out my window on this snowy March day. 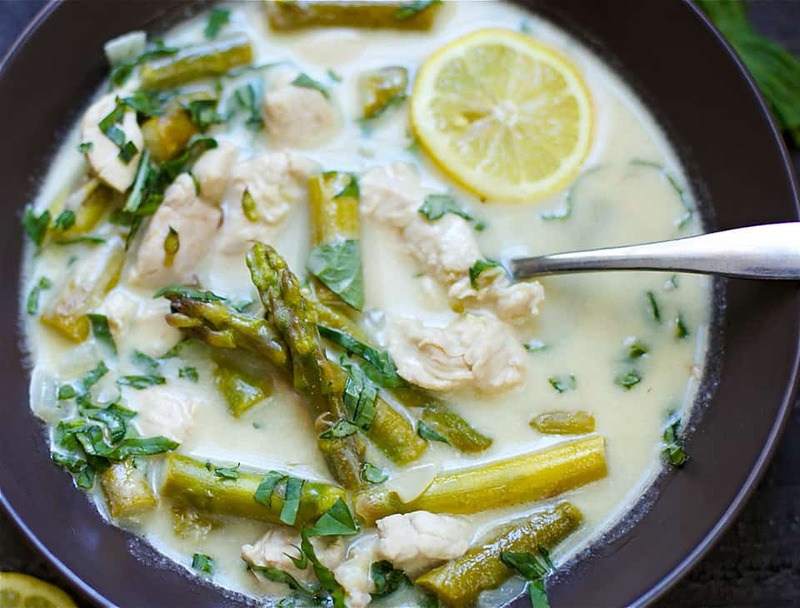 It’s bursting with spring-y flavors such as lemon, basil, and of course asparagus. I even love this idea as a compliment to a brunch or Easter dinner. I think I should just address the elephant in the room and let you know this soup is loaded with coconut milk. I *almost* put coconut in the title, but was hesitant because I didn’t want my non-coconut friends to skip out on this deliciousness. 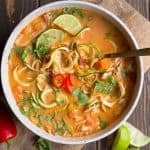 Sooooooo, I suppose if that is you, well you made it this far and I want to tell you: you will love this soup. I can promise. 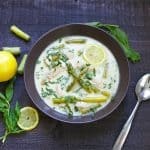 I have a child who does not love coconut milk, and was all over this soup. 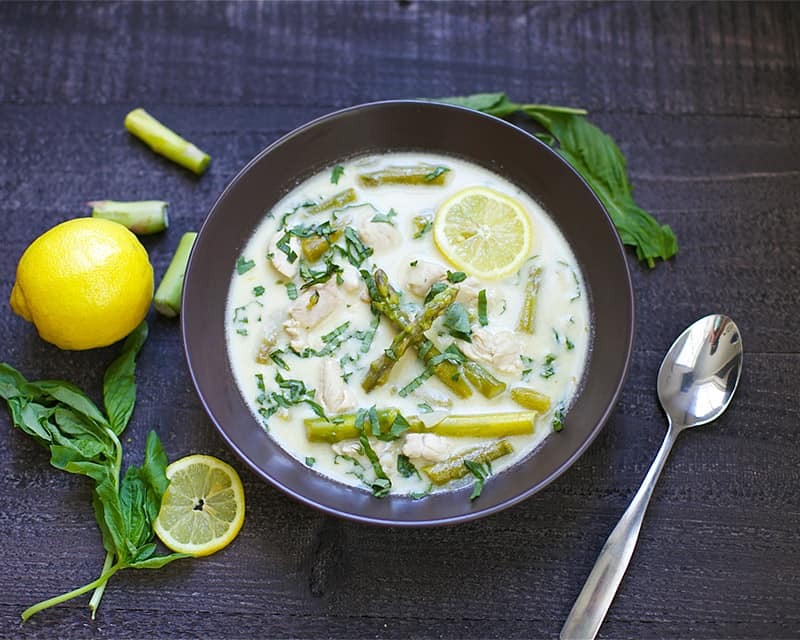 It has a slight coconut taste, but it is also masked by the lemon and basil flavors which compliment the soup in the best ways possible. There is always an option to use half and half, and I give that variation in the recipe. On a busy weeknight, this recipe comes together very quickly. In less than 30 minutes, you can have dinner on the table. 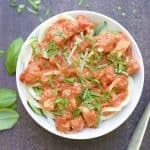 A heavy sprinkling of fresh basil is an absolute must! To prep this dish: chop your chicken breast or tenders into 1 inch chunks. Season with a bit of salt and pepper. 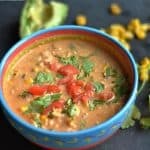 Heat a large soup pot to medium high heat, once hot add in 1 tbsp avocado or olive oil. Add chicken to the pot, and cook for about 3-4 minutes until all sides are lightly golden (chicken may be undercooked inside). Set aside. 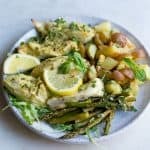 While chicken is cooking, prepare your asparagus. Chop about 1/2 inch off each end. Slice the remaining stalk in 1 inch pieces. Add in another tbsp oil to the soup pot, toss in onion, garlic, and asparagus. Cook for 8-10 minutes or until asparagus is crispy. Toss chicken back into the pot. Add coconut milk and 2 cups broth to the pot. Check to see level of liquid, if you prefer a more liquid soup, add in an additional 1/2-1 cup broth. Heat to a soft boil, then reduce to low. Let simmer for 8-10 minutes, stirring frequently and letting flavors meld. Just before serving, add lemon juice and lemon zest to the pot. Season with salt and pepper. Place soup in individual bowls, garnish with fresh basil. Yes, but the asparagus will get mushy. I would add it toward the end of cook time. Thanks so very much for your response. I will try it.